57 year old David Wayne Sosa, of Frankston, rolled his Chevy 2500 pickup off US-146 (7 miles south of Livingston). Driver Rolls Pickup, Intoxication Suspected, SCHWAB CITY, March 10, 2017 - At approximately 2:30 am on March 10, 2017, a tan late model Chevy 2500 pickup, driven by David Wayne Socia, 57, of Frankston, was north-bound on US-146 about 7 miles south of Livingston (near Myrow Road). Socia's pickup left the pavement to the left, struck a culvert embankment, went airborne landed and rolled. Socia's pickup came to rest on its driver's side in the weeds. Allegiance Ambulance Service was dispatched to the scene along with the Livingston Volunteer Fire Department, Deputy Jason Burleson with the Polk County Sheriff's Office, and Trooper Kevin Burman with the Texas Highway Patrol. Socia was loaded into an ambulance and treated at the scene, then transported to CHI Livingston Memorial Hospital with undisclosed injures. The multiple rolls left a long debris field in the weeds. Some items pulled from the debris field included a .357 magnum pistol, an AR-15 rifle (with several loaded 30 round clips), pills, and 2 bottles of Crown Royal whiskey. Sosa allegedly had been taking xanax pills and consumed whiskey prior to driving. Socia is facing the charge of driving while intoxicated and is possibly facing other charges. Traffic on 146 was not blocked during investigation and cleanup. A rollback wrecker from LakeView Wrecker recovered Socia's pickup and it will be stored in Livingston. Trooper Kevin Burman searches the debris field (Deputy Jason Burleson (right) assisted Burman). 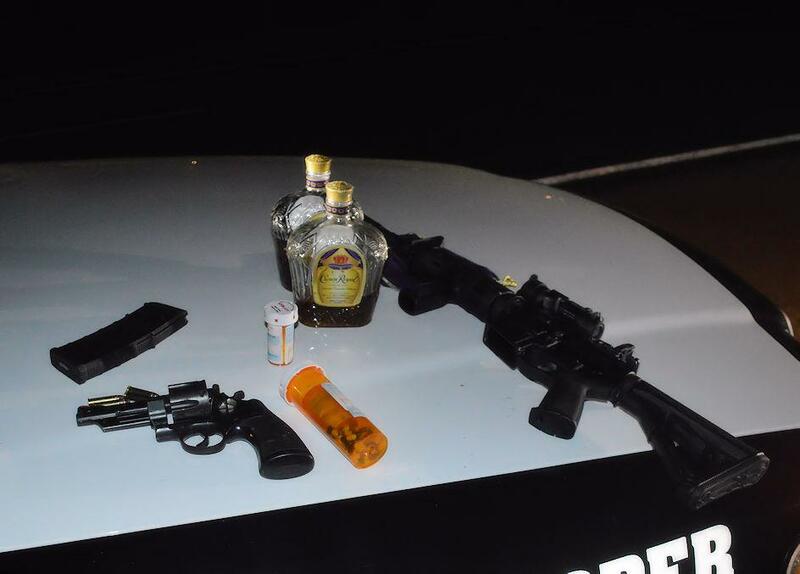 Pills, whiskey, pistol, and a rifle were pulled from Socia's debris field. Burman poured the whiskey out. Socia had 4 loaded 30 round magazines.